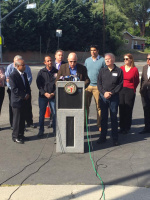 On the morning of Tuesday, April 11 2017, political leaders and members of the community gathered at the intersection of Roscoe Boulevard and Jason Avenue to observe the first anniversary of the deaths of West Hills residents Pia and Erica Botz and their dog at the site. 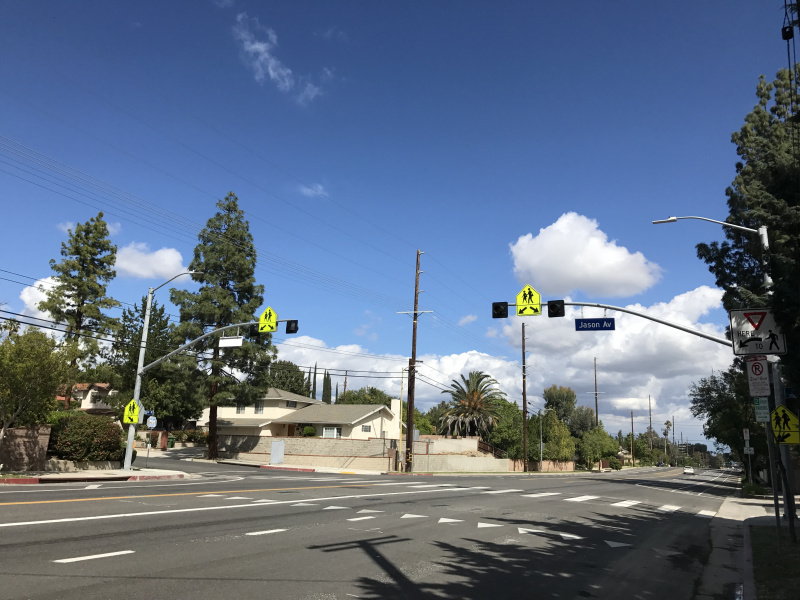 The event also dedicated the city�s first dual-signal pedestrian crossing, built with hopes of preventing future tragedies at the dimly lit intersection near Valley Circle Boulevard. 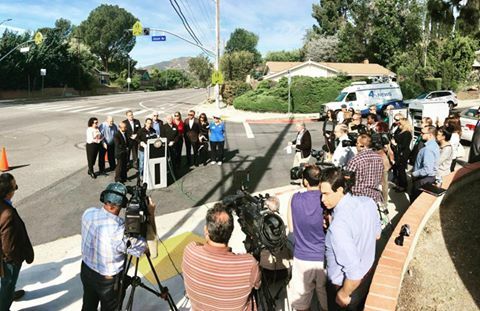 Joined by friends and relatives of the Botz family as well as State Assemblymember Matt Dababneh and several board members of the West Hills Neighborhood Council, Los Angeles City Councilmember Mitchell Englander described his efforts to gain approval and funding for quick installation of pedestrian-activated amber lights integrated with light-emitting diodes (LEDs) embedded in the crosswalk pavement. 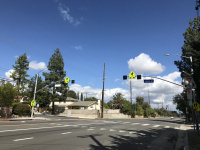 Daniel Brin, president of the West Hills Neighborhood Council, which was an early advocate of the project through its Streets & Transportation Committee, noted in his remarks that �a crossing signal is a beautiful metaphor for all that a city does to keep its members safe as they go about their lives.� "Constructing these lights is an expression of our community coming together for the public good, and Councilmember Englander and his staff deserve our appreciation for their quick action to give focus for that imperative,� he said. 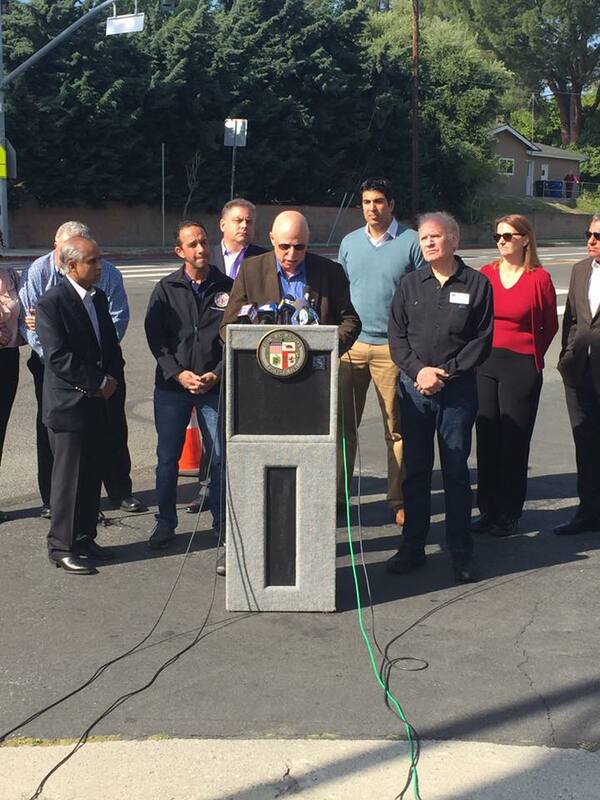 We want to thank Councilmember Mitchell Englander and the Los Angeles Department of Transportation for making this a reality and for making ground breaking initiatives to improve the safety of our community.